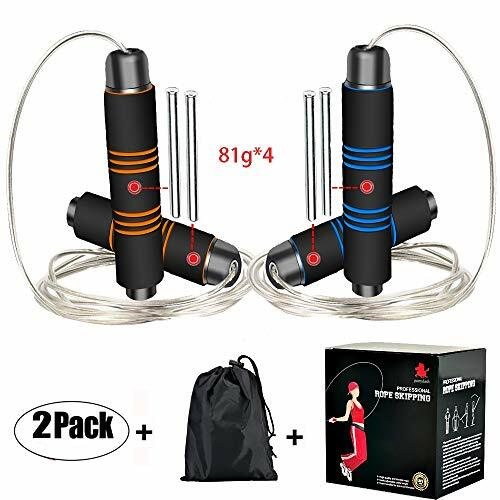 2 Pack Speed Jump Ropes Fitness Rope, Ponydash Adjustable&Durable&Weighted&360 Degree Spin&Foam Grips Handles Exercise Skipping Rope-for Boxing, Crossfit, MMA, Workout -for Kids Women Men Adult by Pony dash at Cardio Fitness Plus. MPN: ROPEADBEOR. Hurry! Limited time offer. Offer valid only while supplies last. [Jump Ropes Set Included]: Package: 1x blue speed jump rope,1x orange speed skipping rope, 1x carrying bag,1x package case, and this professional bearing system and load weight skipping rope with 4x81g load iron block in foam handlesWarranty: No hassle, quick replacement or full refund without return the item if having the quality in 6-mouth. [Adjustable Fitness rope]: Quickly and easily adjustable from 11ft down to your desired length within minutes! The fitness skipping rope is suitable for all experience levels-Cardio, Home Workouts, Cross Fitness, Weight-loss, Gym & Boxing MMA fitness training. [High-quality jumping rope]: Jump rope is made of high -quality material which is deodorant, breathable, absorbent, non-slip and ultra lightweight, thick foam handle offers a soft and comfortable feeling when jumping. [Heavy-duty steel wire rope]: Exercise jump rope cable is made of steel wire with PVC anti-wear tube, No damage and more durable, Rope skipping will not feel so lightweight, suitable for all ages (Adults, Men, Women, Children, Kids, Boys, and Girls.). [Fast rotation speed rope]: 360 degree swivel ball bearing rotation system increases its rotation power and gives you an extreme flexibility of movement. Make The Rope Easy To Slide Without Twisting Or Getting Tangled.[Professional load-bearing rope]: Load of the handle weight 81gx2, it can be taken apart with easy, random change lightweight or weighted jump rope as you like.It is the best gift for your family member that all can use it. If you have any questions about this product by Pony dash, contact us by completing and submitting the form below. If you are looking for a specif part number, please include it with your message.